Why Should You Choose Our Truck Mount Steam Cleaning in Bothell,Wa. Steam cleaning is recommended for cleaning any types of carpets easily. Many homeowners want to use Truck Mount Steam Cleaning in Bothell,Wa. because it is safe and efficient. When you are using this steam cleaning method, you don't have to spend a lot of time for cleaning your carpet. Our company is ready to offer truck mount steam cleaning service for all customers. There are some reasons why you should consider hiring our company today. We always want to offer the best service for our clients. Here are some benefits that you can get when you use our cleaning service.We have some truck mounted cleaning units that are operated by our professional workers in Bothell,Wa. They know how to clean our clients' carpets quickly. They are professionally trained to remove most stains on your carpet without any hassles. Our service is also very flexible for most people. You can choose the best service that is suitable for your needs. Our trucks also consist of complete equipment and cleaning supplies. These cleaning supplies are very important to help you clean your carpet inside your house safely. We don't want to use any harmful substances for cleaning our clients' carpets. Our cleaning service is also affordable for most people. Many customers choose our company because of our affordable rate.You should understand all benefits that we offer for our clients. You should not worry about our service quality. Our company is committed to provide the best service for all clients. You can contact our sales representatives today. 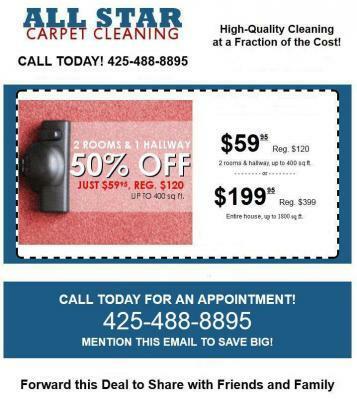 They can give free quote for all customers who want to use our carpet cleaning service. There are many people who are happy with our steam cleaning method. You can read a lot of good reviews and testimonials about our company. Use our high quality steam cleaning service to clean your carpet completely today.